Deep in Antarctica, right on top of the geographic South Pole, there is a research station that peers back in time to the very beginning of our universe. Named the Amundsen-Scott Station, it is home to instruments such as the creatively named South Pole Telescope (SPT), the Keck Array, and the BICEP experiments. The temperature is currently sitting at about -30C and it’s the height of summer. The sun won’t set at the station until March 23rd and once it sets, it won’t rise again until September. So why the heck (or, one might say…Keck) would we build an observatory there? Because the temperature is so low and the altitude is so high (2743m) at the South Pole, the air is thin and dry, reducing blurriness normally caused by the atmosphere. There are no cities nearby to cause light pollution and there are months of nonstop night, allowing for continuous observation. It’s an astronomer’s dream. Except the nearly-constant -30C temperatures. And the remoteness. But otherwise, dreamlike. That’s really the core of the theory: everything used to be really hot and dense and now its not. 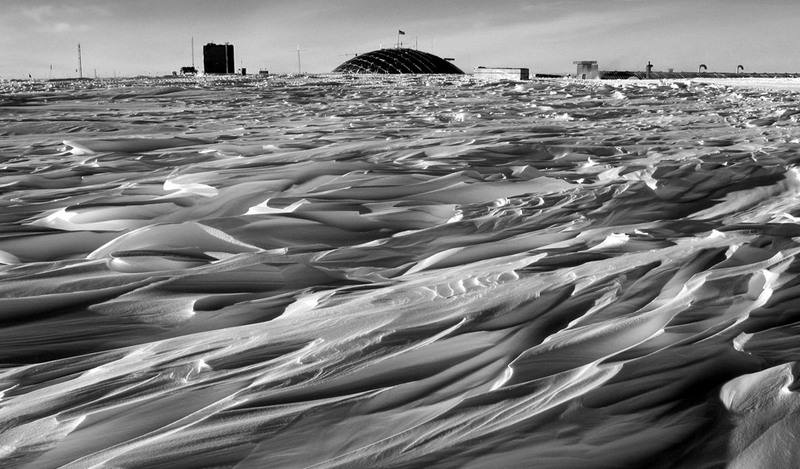 What happened in between is what the astronomers at the South Pole are trying to figure out. Astronomy is awesome because when we look up, we are actually looking back in time. The distances involved are so great that it can take years (or billions of years) for light to reach us. So, what if we just looked as far as we could, wouldn’t we be able to see the Big Bang happening? What would that even look like? Unfortunately, because everything was so hot and dense right at the start of the universe, nothing could stick together so the universe was just a soup of energetic particles. Any light that was emitted was bounced around like the light from a flashlight in thick fog. About 380 000 years after the Big Bang , the universe had cooled and expanded enough to let atoms form and collect electrons. Atoms are mostly empty space, which means that unless they are packed very close together like in a solid or liquid, they are transparent. What resulted was light spreading pretty evenly throughout the universe, starting 13.7996 billion years ago. 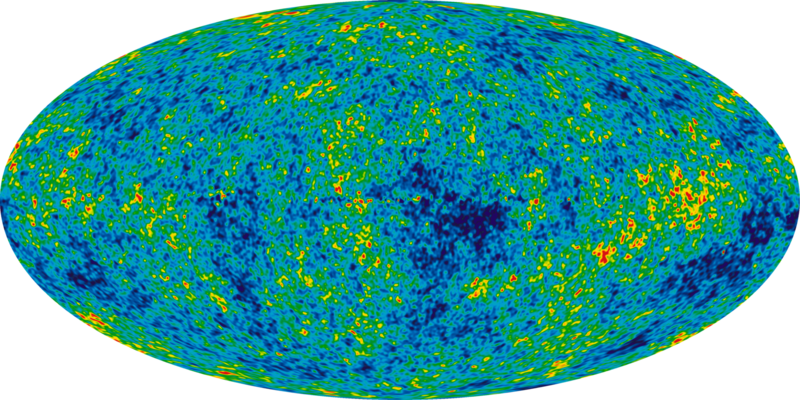 This is what is called the Cosmic Microwave Background Radiation (CMBR). Cosmic because it comes from space, Microwave because it has lost a lot of energy since the Big Bang and is now only 2.7 degrees above absolute zero, Background because it is there no matter which direction you look, and Radiation because it is light. So, no matter how far you try to look, this map is all that you see. It is all that can be seen because it is the oldest light that escaped. Sounds kind of disappointing, but astronomers think that that image (what some refer to as the baby picture of the universe) holds clues to what happened before. 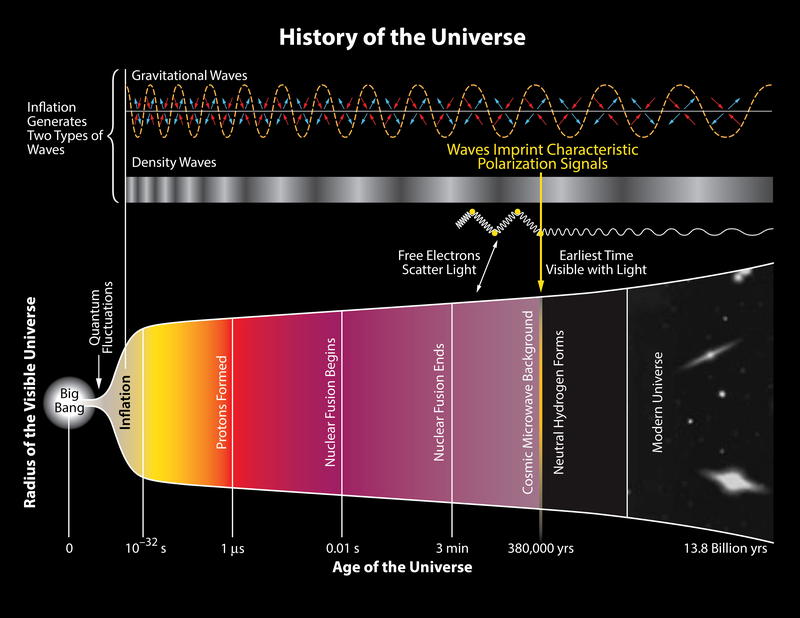 If there was inflation, faster-than-light expansion of space and time (again, check out my essay on the history of the universe if you’re confused), that process should have produced gravitational waves. One of Einstein’s key contributions to science was the understanding that space and time are linked and that they are influenced by mass. He described space-time as a fabric that could be warped by the presence of mass. All that gravity is, he said, is the curvature of space-time around mass. A simplified way to understand this is by thinking of space-time as a trampoline. If you put a mass on the trampoline, it will create a depression. The heavier the mass, the more extreme the depression. Now, if you have an extreme depression and move it very quickly back and forth, it will create waves in the same way that a moving hand in a pool will create waves. Astronomers think that inflation must have created gravity waves with a very specific signature. They also think that very heavy stars moving quickly, like binary neutrino stars, would create these gravitational waves. If (or, once they are discovered for sure, when) gravity waves pass through you, it is space itself which is expanding and contracting. You are not moving, but as the wave passes through your arm, your arm will be closer to your body than it was before and time for it will move slower. The thing about gravity, though, is that it is by far the weakest of the fundamental interactions (Electromagnetic, Weak, Strong being the other, stronger ones). By a factor of about a nonillion (1 with 30 zeroes after it). This makes the waves it creates very difficult to detect. While your arm is probably having a taste of timelordery as you read this, there is no way you could possibly feel it. Gravity waves are not interesting for how they make us feel, but rather for the challenge they present in detecting, for the possible confirmation of our current physical model, and for what they can tell us about the origin of the universe. So let’s come back back to the barren, frigid wasteland of Antarctica and the astronomers freezing their buns off for science. 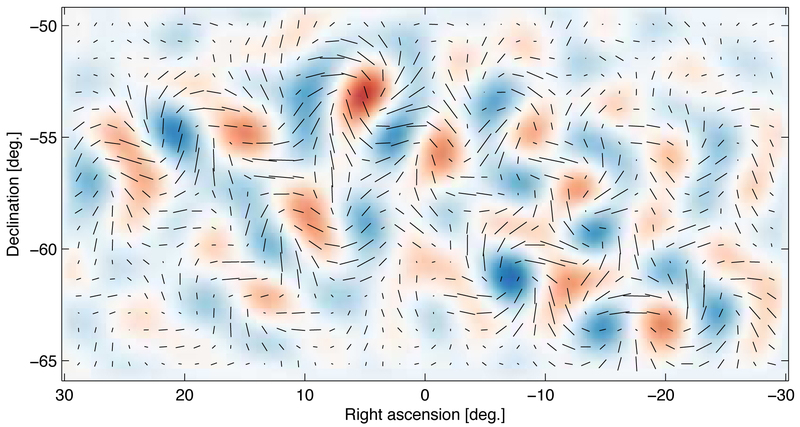 BICEP2, the second iteration of the Background Imaging of Cosmic Extragalactic Polarization experiment, looked at the CMBR and looked for patterns in the light. These patterns, called b-mode polarization, can be produced by gravity waves, but also by interstellar dust. In order to cancel out the effect of dust, the BICEP2 team used data from Planck, a European satellite launched in 2009 with a very similar mission: to study the early universe. Whereas BICEP2 could only look at one particular wavelength with high sensitivity, Planck could look in a few different wavelengths but didn’t have quite as much sensitivity for these b-modes. Dust doesn’t leave the same polarization patterns in light in different wavelengths, so by comparing the results from different wavelengths from Planck, the BICEP2 team was able to show that the b-modes weren’t from dust and so had to be from gravity waves from the early universe. Proof of inflation! Proof of the standard model! A possible Nobel Prize! So, understandably excited and with a positive result in hand, there was a big announcement at the Harvard-Smithsonian in March of last year. Unfortunately, the data they used was preliminary. In September, new data was released and the effect of dust seems to have been larger than they thought. The team reduced the confidence in their findings but still stood by a significant result. Just last month, in January 2015, another set of data was released that makes the BICEP2 findings inconclusive. It seems the team jumped the gun a little bit, were blinded by the impact of their apparent discovery, and had too much confidence in preliminary data. The result of all this is that there is still no direct evidence of inflation or of gravitational waves and the teams at Planck and BICEP are going to work together now with the strengths of their instruments. Within a few years, the effect of dust should be able to be cancelled out and we will be able to see whether we were right about the beginning of the universe. And all the frostbite will have been worth it. Next Entry:Enter The Bat Cave Evaluo-Gram!